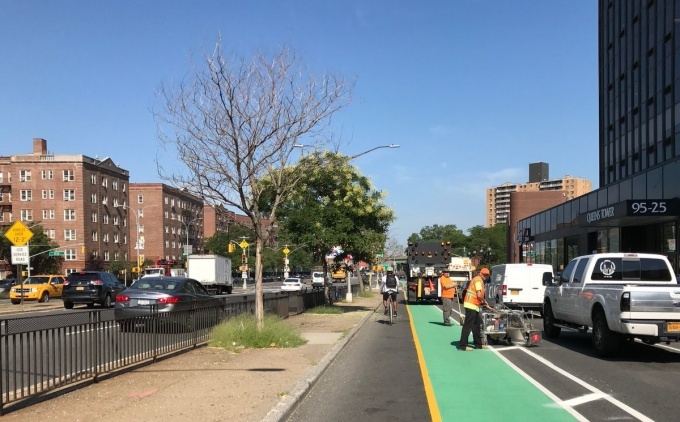 Advocates for the DOT’s program to restructure Queens Boulevard—which includes the addition of protected bicycle lanes–will gather Wednesday to organize support for Phase IV, which would go from Yellowstone Boulevard to Union Turnpike. Transportation Alternatives, a non-profit group with a $4 million budget, will host a meeting in Forest Hills to generate support for Phase IV of the Vision Zero program, which they say will make the streets safer for cyclists, pedestrians and motorists. The meeting will take place at the Queens Bully at 113-30 Queens Boulevard from 7:00 p.m. to 8:30 p.m. The group will discuss petitioning practices and outreach to the community and businesses to generate support. The DOT aims to implement changes to Queens Boulevard— which will include protected bike lanes, stop signs and other safety features —in 2018. Advocates say that Queens Boulevard has become safer since the redesign began in 2015. To date, four miles of roadway along Queens Boulevard has been revamped in the first three phases—from Roosevelt Avenue in Woodside to Yellowstone Boulevard in Forest Hills. Mayor Bill de Blasio announced in May as construction of Phase 3— between Eliot Avenue in Rego Park and Yellowstone Boulevard—was about to begin that there had been zero fatalities on Queens Boulevard since 2014, attributing the results to the redesign of the boulevard. The changes, however, have generated a lot of controversy and mixed views. John Dereszewski, who is chair of CB6’s Transportation Committee, refused to back Phase III in May because it called for the elimination of 198 parking spaces along the 1.3 mile stretch between Eliot Avenue and Yellowstone Boulevard. The construction of Phase III took place in summer and several business owners have since claimed that the loss of parking has led to a downturn in business since their customers are unable to find parking. The Chronicle cited other businesses with similar complaints. Community Board 4 supported Phase II—from 74th Street to Eliot Avenue– with the exception of the protected bicycle lanes. Despite the board’s no vote to bicycle lanes, Mayor de Blasio stepped in and made sure they were installed. The bicyclist don’t follow the traffic rules anyway, what this show is about? Is there a plan to give each bicycle a plate number and registration to owner and license the bicycle owner anytime soon since they have their own roads? The amount of traffic violations by the bicyclists is atrocious. I want to see an actually police stopping and fining bicyclist for running the stop sign, a red light, going an opposite direction of the traffic and ridding on a sidewalk. Putting points on a ridding license and increase insurance will be a fair punishment than only a fine. The pro-bicyclist will all stop whining and bashing the car drivers when every member of the traffic will be responsible for their actions they will turn to politicians for their vows. But so far this is “a tragedy of commons”. It is much profitable and easier to catch the car drivers as an easy target police cannot even catch the bikers who split the lane on a highway. I saw the chase lasted 1 minute a guy just turned around rode an opposite direction and took an entrance ramp, a cop gave up and left babbling to a radio. Most interesting part is those politicians will never put their bottoms on a bike saddle. Their drivers transport them around not even stopping at the stop sign and extremely exceeding the speed limit. Oh yeah, you say they are the privileged ones, not. They are the showboats! Well, they made their bike lanes and the bikers haven’t shown up. I drive that route daily and about 7:45 AM. IF I see 3 bikes, that’s a lot. Even in good weather. True, it may make things easier for those who deliver food from some of the local eateries (such as Tower Diner), but they often are in the road riding opposite traffic anyway, so these lanes aren’t doing anything for them. This is plain old stupidity being shoved down our throats with no regard for the impact it’s had on businesses along that strip. As a lifelong New Yorker and cyclist, I appreciate many of the steps that have been taken in recent years to improve the cycling experience. As a driver, lifelong Queens resident and current Forest Hills resident, I have to say that this plan is a waste of time and money. Almost nobody uses these bike lanes. That isn’t to say that there aren’t cyclists in NY or that nobody uses any bike lanes, I’m saying that nobody uses THESE lanes that are coming this far out into Queens. They don’t go anywhere. Are city residents claiming that people have some innate need to ride their bicycles to to corner of Union Turnpike and Queens Blvd?! It’s not like it’s going to some park or beach or shopping center. It would give access to the residents of that area to cycle west more easily, but those are the people most vocal about NOT WANTING IT! Promoting necessary change for a cycling need is fine, I get it and I agree with it. This, simply put, isn’t that. These lanes just aren’t used at a high enough level to warrant extending them. Spend a week in the middle of summer observing them and how much they’re used and nobody in their right minds would think they’re necessary. Those bike lanes are insanely dangerous to bikers and drivers. Cars double park because there is not enough parking, so other cars go over the bike lanes. It is criminal waste of public funds, completely unnecessary. It greatly reduced quality of life in the neighborhood. Total insanity! All of these community events looking for input are completely one sided, they do not care about what we think, the DOT is pushing ahead with the crazy idea despite opposition. Just look at Elmhurst – the Community Board voted down the bike lanes but deBozo wanted them anyways, so in they went. Who cares about what the people living in these communities actually wants? A survey group was out last month getting feedback on Queens Blvd in Forest Hills and the minute I told them my concerns about losing so much parking to the bike lane, they changed their tune and then tried to tell me that they could search for alternate parking solutions in the area. Really?? Have you seen how clogged this neighborhood already is?? These are the wacko’s doing deBozo’s bidding. If most people along Queens Blvd do not own/lease a car, then why would most people be against a traffic calming plan? Even many drivers are in favor. Absolutely infuriating! I’m sick of all their bogus “planning sessions” and community input nonsense. They care NOTHING about the community. The community board in Elmhurst voted DOWN the bike lanes due to the loss of parking spaces, but because this is deBozo’s mission, the lanes got put up anyways. Any community planning session is a total waste of time as the city has their own agenda with this and is determined to make our lives miserable here because deBozo sees this Vision Zero nonsense as his legacy. The DOT had their worthless representatives out by the 75th Ave. E/F stop last month seeking “community input” and once I told them my concerns about the loss of parking, you could see they didn’t want to go there with me and actually had the nerve to suggest there could be alternative options to fix the loss of parking, meanwhile he had NO examples to offer me and knew he was digging a hole and that’s where it all ended, but he took down my comments on his notepad, which I’m sure he threw out a minute later. Really doofus?? Alternative options for parking?? In Forest Hills and Rego Park?? Have you not seen that literally anywhere a car can be parked, something is already parked there and we have no more room to give! Total insanity!! Absolutely infuriating! I’m sick of all their bogus “planning sessions” and community input nonsense. They care NOTHING about the community. The community board in Elmhurst voted DOWN the bike lanes due to the loss of parking spaces, but because this is deBozo’s mission, the lanes got put up anyways. Any community planning session is a total waste of time as the city has their own agenda with this and is determined to make our lives miserable here because deBozo sees this Vision Zero nonsense as his legacy. The DOT had their worthless representatives out by the 75th Ave. E/F stop a month ago seeking “community input” and once I told them my concerns about the loss of parking, you could see they didn’t want to go there with me and actually had the nerve to suggest there could be alternative options to fix the loss of parking, meanwhile, he had NO examples to offer me and knew he was digging a hole and that’s where it all ended, but he took down my comments on his note pad, which I’m sure he threw out a minute later. Really doofus?? Alternative options for parking?? In Forest Hills and Rego Park?? Have you not seen that literally anywhere a car can be parked, something is already parked there and we have nothing else available! Total insanity!! Notice how everyone here complaining can’t spell correctly? I’m sick of all their bogus “planning sessions.” They care NOTHING about the community. The community board in Elmhurst voted DOWN the bike lanes due to the loss of parking spaces, but because this is deBozo’s mission, the lanes got put up anyways. The city has their own agenda with this and is determined to make our lives miserable here because deBozo sees this Vision Zero nonsense as his legacy. The DOT had their worthless representatives out by the 75th Ave. E/F stop last month seeking “community input” and once I told them my concerns about the loss of parking, you could see they didn’t want to go there with me and actually had the nerve to suggest there could be alternative options to fix the loss of parking, meanwhile he had NO examples to offer me and that’s where it all ended, but he took down my comments on his notepad, which I’m sure he threw out a minute later. Really doofus?? Alternative options for parking?? In Forest Hills and Rego Park?? Have you not seen that literally anywhere a car can be parked, something is already parked there and we have no more room to give! Total insanity!! This is ridiculous. Forest Hills is WAY too crowded! I agree with people. No Bicycle at Queens Blvd. We have two parks near by Forest Park and Frash Corona Meadow Park. I enjoy cycling there. You should be a crazy one if you are cycling on Queens Boulevard. It is bad for drivers AND cycling people. Many people use bicycles for transportation, and Queens Blvd is an important route. Where does it say that parking is a right! I have a car and pay for a parking spot. I also bike and can tell you that it is faster to go into NYC now with a bike than Bus and train,due to the direct lane from Yellowstone to Bridge. There are many people that use Queens Blvd. we need to get out of the mind set that roads are only for cars. We all need to share the space we have. All studies show that it is safer. Hundreds if not thousands of people are suffering now because of the parking situation. They are unable to come home normally after work without spending at least an hour looking for parking. Re-consider this project immediately !!!!! How about those that are killed, seriously injured or suffer substantial property damage? I don’t know who was an initiator of this stupid green line, but it’s killing business. Yesterday I was driving on Queen’s blvd and stupid bysicle rider was riding on my right side ahead of me. NOT ON THE GREEN LINE!!! I’m a cyclist AND a driver. The existing QB bike lanes are poorly designed. By eliminating parking PLUS any place to stop, pickup or dropoff passengers or make deliveries (which will happen regardless of painted lines) , drivers drive into the bike lanes… a situation unsafe for the very riders its supposed to protect. People bicycle commute year round. This is ridiculous. Rego Park is building more buildings and there are spots for parking . The hell with the damn bike lane. Who is going to ride their bike when it’s pouring or snowing out ? I doubt this is going to last long . The people need to stand up and speak up . Why is everyone sleeping ? No Bicycle lane!!!!!!!! this is ridiculous!!! Forest Hills is WAY too crowded! we didn’t have parking to begin with. We are not In Florida where the weather is sunny almost all year round and people would need access to a bicycle lane. This must end now! Local businesses are loosing business because people cannot even park next to their favorite stores or Restaurants.listen to the people!!!! We Know what we are talking about! I owned a business, in Rego Park, I own a car, and Im a cycling athletic person, we need more safety cycling road, good for you, for your health. That sounds good I’m theory. I still continue to see cyclists without helmets ignoring the rules and not using the bike lane. This is absurd! It now takes me 45 minutes to find parking at night. There are 3 event halls and restaurants without parking lots in that little stretch on queens blvd. Cyclists are out all year, but if you don’t want to believe that people bike for commuting or leisure only in warm weather, consider this: do you and the other residents of Forest Hills only order delivery food in the summer? I imagine you order year round – working cyclists need safe lanes all year. I can’t make this meeting !! I’m realky angry about what they did with the bicycle lanes and the congestion of buses and cars double parking !! I live near 71st and Queens blvd is so congested it’s 30-40 minutes wait for a bus !!! What gives ?? The service lanes should be bikes and buses only. Maybe in a decade or two. I agree with Jay Parker and I don’t even drive. Go to Europe and see how they designed bike lanes. They do not put them in the middle of the boulvards. They should not be dangerous to traffic. They should not cause huge traffic jams. All the stores and restaurants are very difficult to visit with this hideous design. Makes many coop owners upset, I want to sell my apt. and move out. The area is going down fast! Thanks to de Blasio who doesn’t even live here.